Almond butter is one of the finest baking ingredients and can also turn out to be an ideal replacement for peanut butter in sandwiches. Many people use peanut butter regularly because of its nutrition value; however, almond butter contains a larger proportion of manganese, potassium, calcium and iron. At the start of the recipe, it is imperative that you decide whether you prefer toasted almond butter or not. You are required to preheat the oven to 350 degrees F.
Bake the almonds for about 10 to 12 minutes after spreading them evenly on a cookie sheet. Having taken the almonds out of the oven let them cool down for a few minutes so that they can be handled. Grab a mortar and a pestle and grind 2 cups of almonds until they become powdered. You can also use a heavy-duty blender for this purpose. Some people use a combination of methods to grind the almonds finely. You can initially use a mortar and pestle and then put the almonds in a blender to save time and effort. After grinding the almonds, you need to mash or blend them with 2 tablespoons of olive oil slowly. Do that until the mixture becomes smooth and creamy. 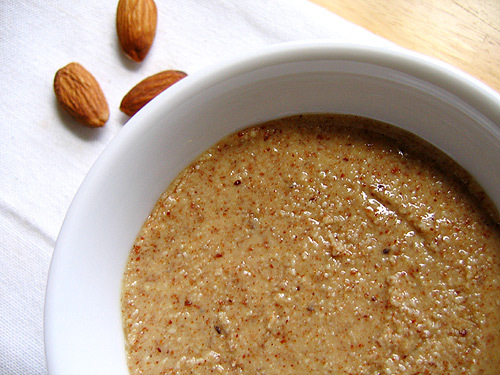 Take the almond butter out of the pestle now and put it into a bowl. At this moment, you should decide whether you want smooth or chunky almond butter. You can add salt if you want the almond butter to be salty, and you can add brown sugar and/or honey if you want it to be sweet.